Carnegie Oldpark Road Library was the first of three Carnegie libraries to be funded by steel magnate Andrew Carnegie, a native of Dunfermline whose family emigrated to America when he was three. Carnegie became one of America’s ‘Robber Barons’ in the company of men like J. P. Morgan and William Randolph Hearst, who in business had a reputation for their unscrupulous nature and total ruthlessness. However, after selling Carnegie Steel Company (topically, later to become US Steel) to J. P. Morgan in 1901 for a colossal $480m, for the last 18 years of his life he devoted his attention to philanthropic works. Carnegie felt that “there was no use to which money could be applied so productive of good to boys and girls’ as the founding of public libraries” (Grimes 1998). In his lifetime he financed around 2,700 libraries in 10 Countries where the large majority of these were located in the US, Canada, Britain and Ireland. The Oldpark library was the first of three libraries to be built by the Belfast Corporation with a grant of £15,000. The offer of funding from Carnegie was conditional on the library raising the rate to pay for maintenance of the new buildings on the three sites that were provided by the city located in socially deprived areas. 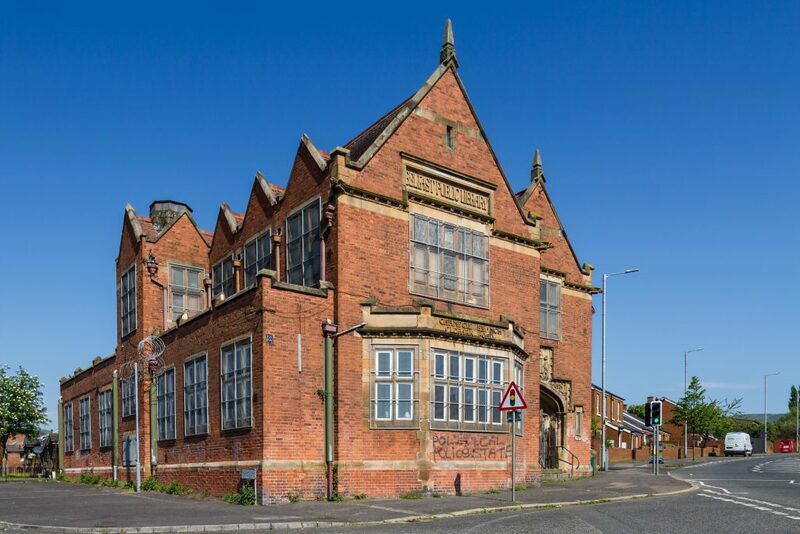 Carnegie Library at Oldpark Road is a detached gable/fronted redbrick and sandstone Tudorbethan building, built to the designs of Watt and Tulloch and opened on 30th November 1906. 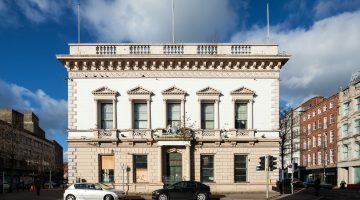 A highly decorative building with a carved sandstone over panel with raised central panel filled with the Belfast Coat of Arms stating the Latin motto “Pro tanto quid retribuamus” meaning “for so much what shall we repay” in translation. 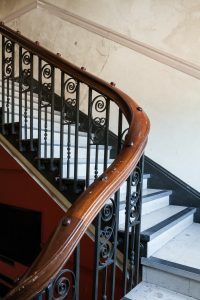 The quality of the materials used in the construction echo Carnegie’s wish for a lasting public benefit. 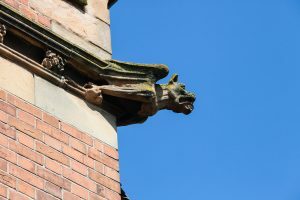 Red brick, ornate sandstone gargoyles, detailed interior metal work, and cleverly engineered roof structure have perhaps ensured that the building has remained in relatively good condition. The designs for the three libraries were procured by competition confined to Belfast architects and selected by Sir Thomas Drew where architects Watt and Tulloch were selected on merit of their skilfully adapted designs to the irregularly shaped sites. 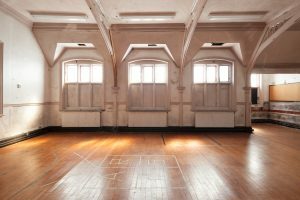 For Oldpark the space accommodated a lending room, news room, staff work room, newspaper filing room, attendants room and WC on the ground floor with a juveniles’ room, magazine room and ladies’ room on the first floor and built in a distinctively Tudor idiom. The library was inaugurated in 1908 and provided a wealth of resources to the Oldpark area where the present anecdotal stories from the community reiterate the value of such a resource and the significance it had on the people who lived in the locality to this day. However, on the 22nd June 2010 the Oldpark library closed its doors and lay vacant before subsequently added to the Built Heritage at Risk Register (BHARNI). Meanwhile, the Falls Road Carnegie building remains a public library, continuing community access learning, whereas the Donegall Road Carnegie Library was fully restored in 1999 by Andrew Nesbitts Architects, whose office is in part of the building while using the remaining space to provide rental income to help maintain the building and covering associated running costs. Janice Beggs, a member of the community and of the Local Oldpark Community Association (LOCA) saw the opportunity to buy the library and took her life savings in a bid to win the library back for the community when it went to auction. Seeking the help of Quintin Oliver of Strategem who knew the potential of the building and its worth to the community, Mr. Oliver supported her investment and subsequently became the owner of the library. Foundation Northern Ireland have already received a start-up grant from Heritage Lottery Fund (£9,200) and a Project Viability Grant from Architectural Heritage Fund (£3,000) which have aided the first steps of this project for the Northern Ireland Foundation to test the viability of potential uses while facilitating a complete condition survey of the building. Thinking creatively about the sustainable use of the building and the needs of the community is at the priority for the groups involved but until such time when the building can be repaired the current custodians are opening the doors and inviting people in to rediscover the essence of Carnegie Oldpark Library.